Oh, bike bag, you’re the only one who understands me . . . . I have not been doing a ton of sewing this week (more fabric in than out these days–whoops! ), but I do have that little bag up top to tell you about. This was another request from my honey for a little bag to use when he’s out on his bike. (The type of cycling he does is called randonneuring–long-distance, self-supported, non-competitive cycling. Basically, cycling long distances (100 kilometers and up) on a set route with controls where you have to stop and get a receipt or signature to prove you were there. You have to finish within the time allowed, but it’s not a race to see who finishes first.) He’s set on waterproof bags to carry things like his rain gear and tools while on the bike, but he needed a little bag to carry his phone, brevet card, and wallet when he gets off the bike at controls. I’d made him one previously, but he decided he wanted a different style and size this time. He uses these bags a lot, and doing bike rides that last from 6 hours all the way to several days gives you a fair bit of time to think about your gear, so he has some very definite opinions on what features his bags should have. This is about 7″ high by 5″ wide. All scraps from the stash: black cotton duck, plain white cotton for the lining, split rings and Velcro from my collection of purse hardware. The little zip came from a cheap, nasty, plasticky purse that my mother was getting rid of. Tip from somebody who makes a lot of bags: even cheap and nasty purses tend to have good-quality zippers! This is a big, beefy coil zipper, the kind I like because they’re tough without being super bulky. I had a couple of problems to solve in making this. First was how to make the zipper coin pocket on the outside front. The solution I came up with was to cut three of the front pieces out of the black fabric. One of them was sewn to one side of the zipper, the second was sewn to the other side of the zipper, and then the unit was trimmed to match the third. 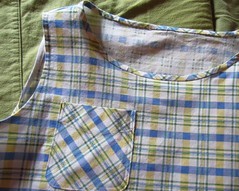 The zipper unit was then basted to the third front piece, which now serves as the back of the pocket. The second issue was what size to cut the front and back so that I could box the corners of the bag. I found this really nifty guide to the math of boxing corners here (scroll waaaaayyyy down to the end) and it worked perfectly. So I got this little bag done on Friday afternoon, then we ran off to Wenatchee for my honey’s latest ride. I didn’t take any pictures in town, as where we were staying in East Wenatchee was basically one big mall punctuated with fast food restaurants, but I did get a couple of good ones on the way home Sunday. Carrying all the electricity generated by the Rock Island Dam. Viewpoint over the Columbia River. A few spring wildflowers among the sagebrush and rock. Soon to be gone–we’ve had a couple of near-90-degree days here already. Then it was back home to the floof and his little sister. Anyway, have a great week, everybody, and I hope you find a little time soon to do the things that make you happy with the people you love. I am a little tired and low on words tonight, but I do have a few pretty pictures for you, so let’s take a look. I finally finished up the mini quilt for my sister’s birthday, only a little bit late. I don’t know why I sometimes lose steam in the middle of projects, but I sure did on this one, so it took longer than it should have. Pattern is Frankie the Frenchie from Sew Quirky. This is about 13″ square. Frankie is a bit smaller than he should be, simply because I had to print the pattern at 95% size to get it all on regular printer paper. Other than that, this project went pretty smoothly. I used Steam-a-Seam 2 again on this, and I think I may be moving along the learning curve on it–gets easier every time I use it. I hand sewed the smallest pieces on there–just easier than trying to get the machine to navigate those little curves, though buttonhole stitch worked through three or four layers of fabric and fusible can also be hard work. Rain was in the forecast when I did it, and my hands were not very happy about those layers. I didn’t really plan on such dense quilting–it just sort of happened. I did the outline and added a few swirls, but then it looked strange to have the area outside of that be unquilted, so I had to fill it in. An important note on doing spiral quilting (which I definitely need to remember for next time): for reasons that aren’t very clear to me, spiralling counter-clockwise, as I’ve done here, is significantly more difficult than going clockwise! It’s harder to see what you’re doing when you’re going counter-clockwise, but I don’t think the difference is down to just that. I can’t really explain it, but it just seems much easier, and looks much better, when done clockwise. This past week I also did some work cleaning up and organizing my knit stash with the help of some new-to-me plastic drawers from Goodwill. I also donated a plastic tote full of bags I sewed years ago for a craft show. It made me a little sad to see them go–they represent a dream that I had that fell by the wayside–but it also felt like a step forward. I’m trying very hard to work toward new dreams, and it’s time to let some old ones go. Yes, it’s the Mending Pile of Doom. Or maybe Return of the Mending Pile of Doom? Anyway, it actually toppled over the other day, so maybe that’s a sign that I should deal with it. There’s some darning in there, another pair of pants that needs pockets, and a couple of the dreaded zipper replacements in ready-to-wear garments, everybody’s favorite mending job. So this coming week should probably be designated as Mending Week, and I should probably try to be a responsible adult who tackles difficult challenges head-on and forgoes immediate gratification. Well, I’ll take a stab at it, but no promises. If I get halfway through the pile and decide to take a mental health break and sew something fun, I’m totally gonna call Mending Week a success. It’s spring and I’ve got that fun knit with the bees and flowers on it, so don’t count on me being a responsible adult for too long. Here’s another picture of my bestest buddy, just because. Have a great week, and I hope you’re not being so responsible that you don’t have time for a little spring fun. WIP (Almost) Wednesday: Still Here! Yep, it’s this dork again. I’ve just been sick, and have had a hard time getting over it. Many things that needed to happen the last couple of weeks just haven’t, because I haven’t had the energy to get them done. Hopefully that will not be the situation for much longer! And so many apologies for not responding to your lovely comments for so long–I do always appreciate them so much. I have various things in process–Xmas is looming!–but I’ll just focus on one project today in order to avoid writing a massive tome of a post. I love the asymmetry of this, the motion, and, of course, the colors. 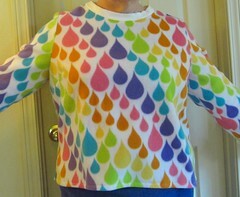 But she used ombre fabric, which I don’t have. What to do to get some depth and complexity in the triangles? 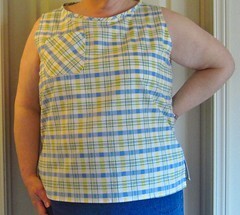 I pieced strips of fabric together, trimming each one into a rough triangle before adding the next strip. I chose pretty similar scraps to keep the variations subtle. Then I used Steam a Seam to cut out my triangles and fuse them to my backing fabric, a piece of white linen from the stash. I did eventually get everything in place and fused down and I started to sew on the appliques . . . and half of them promptly fell right off. And then my sewing machine decided to go on the fritz. I’ve cleaned and oiled it, but it’s sort of sticking, then releasing, over and over, as I sew. Which is kind of a pain on these teeny weeny little triangles (the larger ones are 2 1/2″ square), and is not going to be workable when I try to quilt this thing. I’m headed out of town tomorrow, but will fiddle with the machine next week and see if I can’t fix the problem. Have a great week, and I hope you’re getting full cooperation from all your mechanical friends.